Blind Justice Bronze Sculpture Statue. 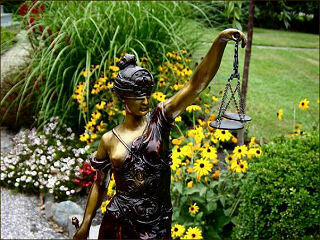 Also known as Themis the Goddess of Justice and Virtue. If you have been looking for one of these I'm sure you have seen a lot of junk that is out there. Maybe you have even mistakenly bought one. Look at the detail on this piece. This is a first class sculpture and one you would be proud to display. The detail of this piece is amazing. I've seen lots of these pieces around, but never one quite as nice as this. The dress is done in a beautiful dark red patina that makes her particularly well suited to an office decor. We can also do the dress in an antique Verdi Green patina. Click on the photo above for additional pictures. This piece is 24 inches high and 8 inches wide at the base. It is mounted on a polished marble base. We also have a slightly smaller and a life-size version of this piece available.